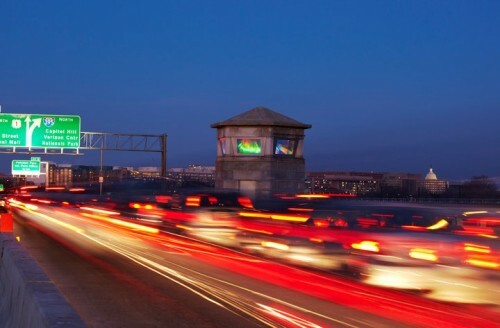 PoPville » 14th Street Bridge Art Display is Sweet! 14th Street Bridge Art Display is Sweet! Visitors who approach the District from the south will receive a colorful welcome when the 14th Street Bridge rehabilitation project is completed. The northbound bridge has not opened as a drawbridge since the 1960s, but the Operator’s Tower still stands and is now receiving a much-needed facelift as part of the project. That facelift includes the addition of a dynamic light feature in the tower’s six windows, that will serve as a beacon into the city. Artist Mikyoung Kim’s kaleidoscope effect design was selected from 122 applications and four other finalists by the DC Commission of the Arts and Humanities (DCAH). 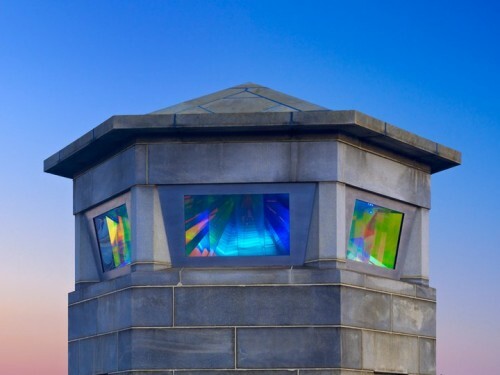 Reflective and dichroic acrylic and light kaleidoscopes have been embedded in the frames of the six windows, and displayed with a rotating lighthouse beam. The light feature will be visible day and night. Rogue States to Re-Open in Dupont in Feb.